It’s that time again! Time for Apple to unveil its latest iPhones and get us all excited about the steady march of technological progress. This year, Apple had plenty to cover. 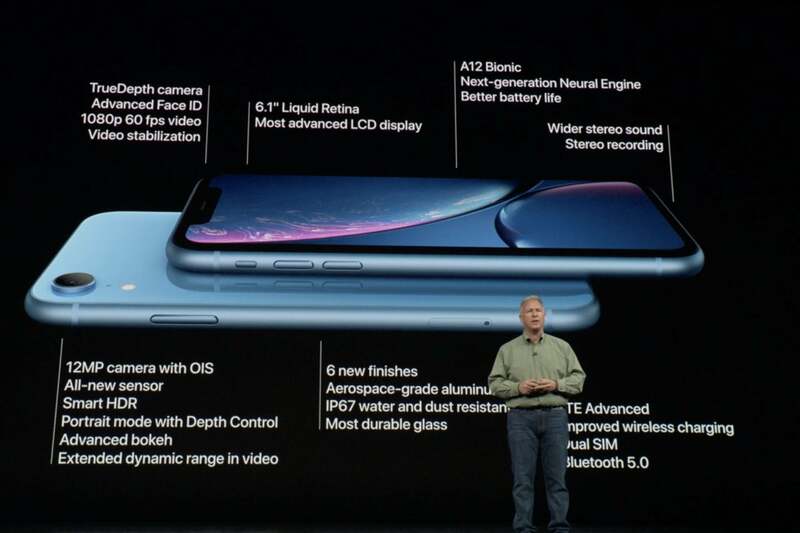 There are three new iPhones, all of them with the the powerful A12 Bionic processor and TrueDepth camera and Face ID system that was previously exclusive to the $1,000 iPhone X. There’s also a hot new Apple Watch Series 4. You’ll be able to watch a recording of the live event on the Apple Special Events page, but if you don’t want to (or can’t), here’s a brief summary of all the major announcements made at the September 12 event. When Apple introduced the new Series 4 Apple Watch, it said, “Everything about it has been redesigned and re-engineered.” And truly, this is the first Apple Watch to have major, obvious design changes rather than the minor tweaks we’ve seen in previous models. The new Series 4 has a much larger display, but the case is only about 2mm bigger, and thinner. To start with, it’s slightly larger—the sizes are up to 40mm and 44mm (from 38mm and 42mm). However, it’s thinner, so the total volume is less than the Series 3. They feature new displays with curved corners, pushed out to the edge of the case with very slim bezels. 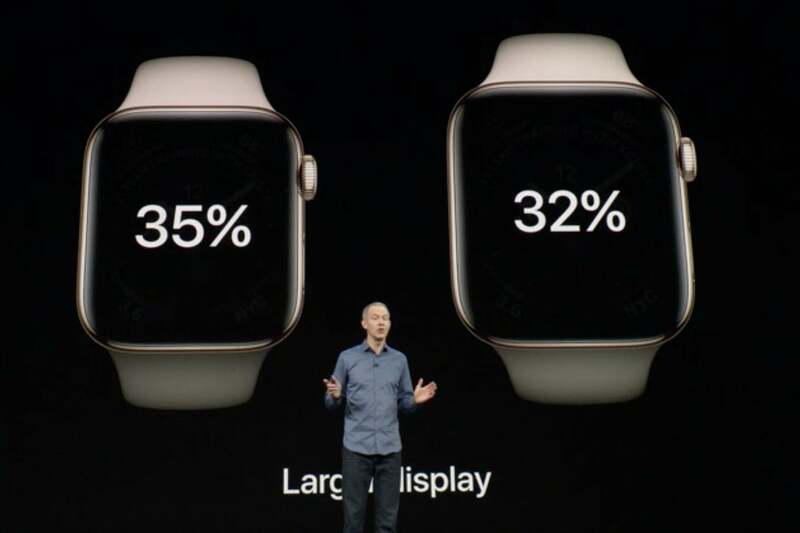 Apple says the smaller of the two displays is 35 percent larger than previously, while the bigger watch is 32 percent larger. There are a host of new watch complications that show more detail, and new updated watch faces, including one that can be customized with up to eight complications. The larger display means room for more complications with more detail, if you want them. The digital crown now has haptic feedback, the speaker is 50 percent louder, the back is sapphire crystal and ceramic to it allows radio waves to pass through for better wireless reception. Powering the Apple Watch Series 4 is a new S4 processor that includes a dual core 64-bit CPU and new Apple-designed GPU, which Apple says makes it up to twice as fast. There’s a new second-generation accelerometer with twice the dynamic range, that takes samples over eight times as fast and can detect up to 32g forces. This allows the watch to detect accidental falls, and can automatically message your emergency contact when it detects one. The new optical heart rate sensor is improved, and can detect low heart-rate problems and detect atrial fibrillation (Afib). Apple doesn’t promise that it will detect every Afib event, but it’s still going to help a lot of people. The improved accelerometer can detect falls and automatically notify emergency contacts. 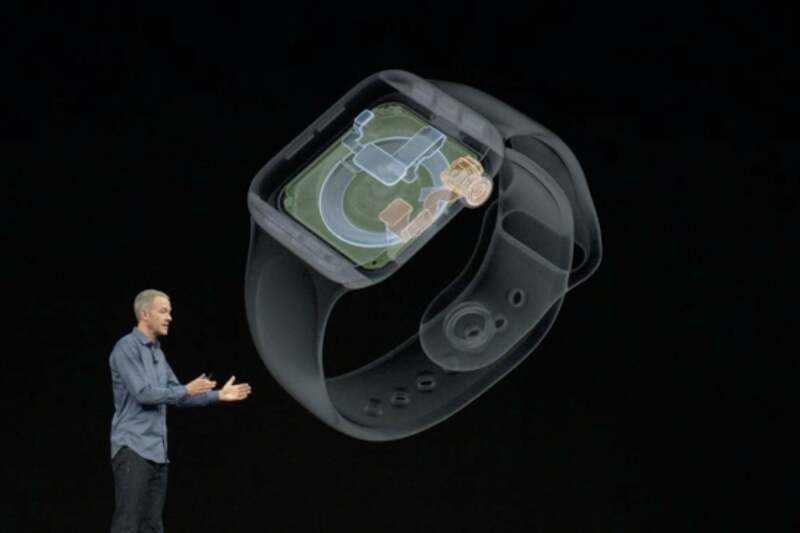 Apple added a new electric heart rate sensor, designed in-house, with electrodes on the back of the watch and on the digital crown. You can take a 30-second electrocardiogram (ECG) and get a classification from the watch. The data is saved in the Health app, and you can even export a PDF for your doctor. 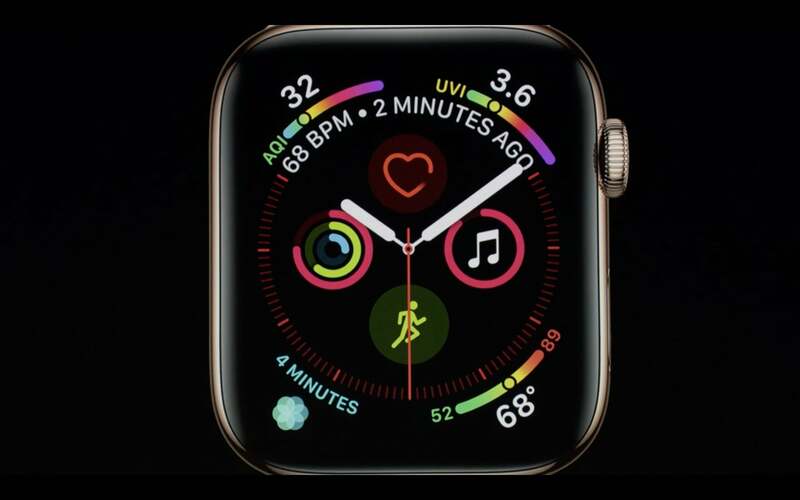 The Apple Watch Series 4 has a new electrical heart sensor that can perform a basic form of electrocardiogram (ECG). Apple promises the Series 4 will have the same 18-hour battery life as the Series 3, but outdoor activity tracking battery life has been improved. The Series 4 will start at $399, or $499 for the cellular version, with the aluminum version available in silver, gold, and space grey aluminum. Stainless models are available in polished, black, and gold. It’s available on September 21, but the Series 3 will continue to be sold starting at $279. And it’s compatible with all your existing bands, too. 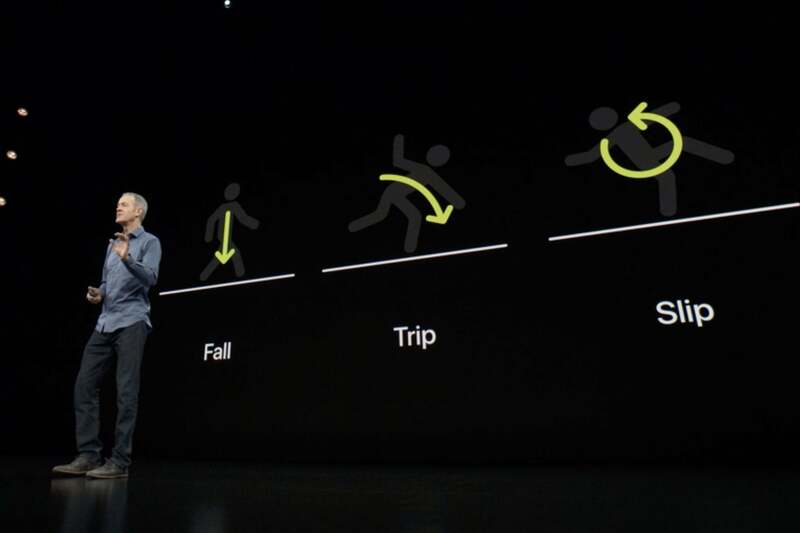 Tim Cook introduced the new iPhone XS by saying it is “by far the most advanced iPhone we have ever created.” One would certainly hope that they’re not getting less advanced with time! The iPhone XS is very similar to last year’s iPhone X, with a screen size of 5.8 inches and a resolution of 2436x1125. The display now has a 60 percent greater dynamic range, however, and better stereo sound. It is again available in silver and space grey, with a new gold color added this year. The iPhone XS Max is just like the iPhone XS, only bigger, with a higher-res secreen and bigger battery. 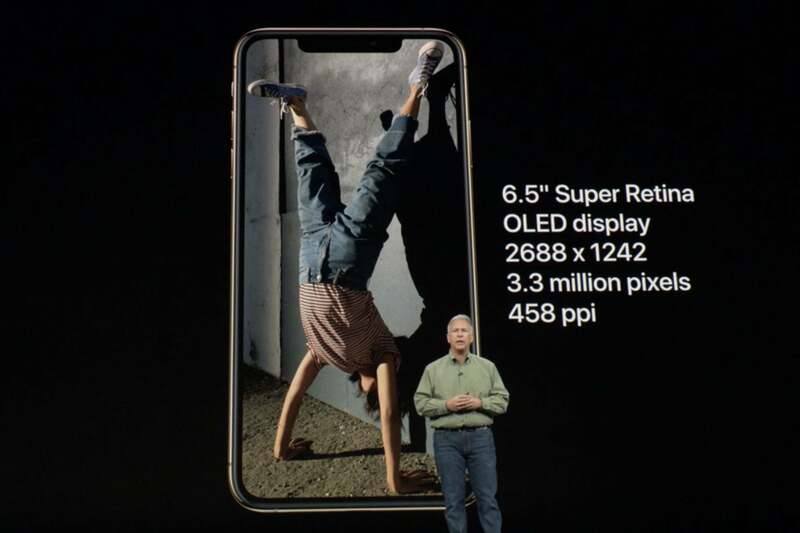 It is joined by a larger-sized sibling, the iPhone XS Max. The phone itself is roughly the size of the iPhone 8 Plus, but with a big 6.5-inch edge-to-edge display. It has a resolution of 2688x1242, matching the 5.8-inch model’s 458 pixels per inch. Both phones are now rated for IP68 dust and water protection, better than the iPhone X or iPhone 8. Apple says it’s rated for up to 30 minutes in up to two meters of water, and it was tested in all sorts of fluids like chlorinated water and salt water. Face ID has been improved with a faster secure enclave and faster processing algorithms, so it unlocks your phone even faster than before. 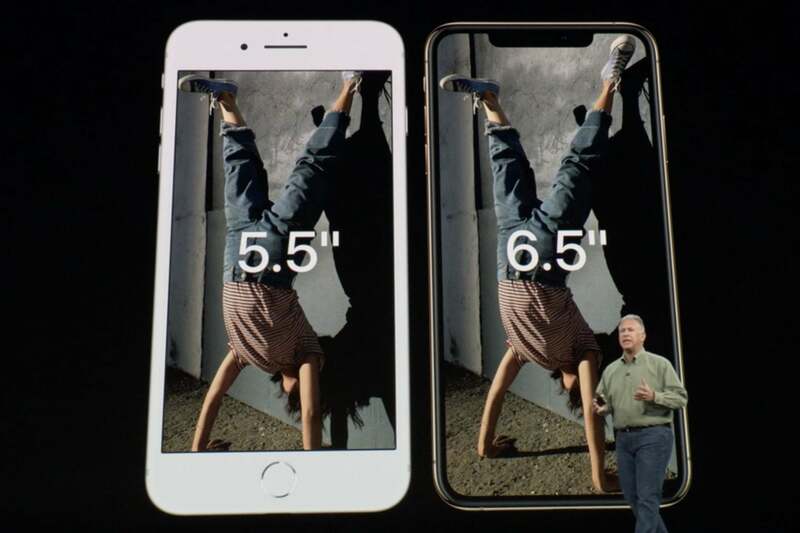 The iPhone XS Max is about the size of an iPhone 8 Plus, but with a much larger display. 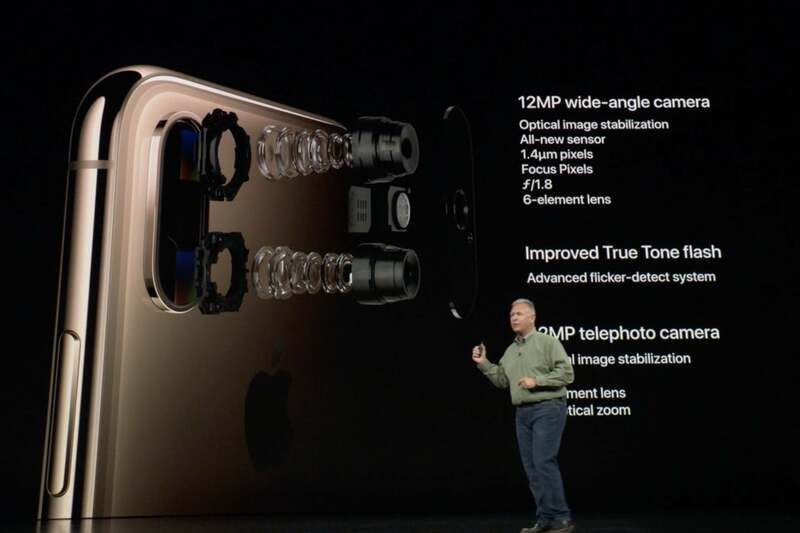 The iPhone XS has a new dual-camera system, with a new sensor for bigger, deeper pixels on the 12 megapixel wide-angle camera, and a new True Tone flash. There’s new image processing software that combines the CPU and neural engine to perform over a trillion operations on every photo, and improves portrait mode. The TrueDepth module on the front has a new 7 megapixel sensor that is twice as fast as that in the iPhone X. The new iPhones feature the most advanced cameras Apple has yet produced, both hardware and software. The camera now has a new Smart HDR mode that takes a bunch of exposures and combines them intelligently for more detail in dark areas and better highlights in way more challenging situations. 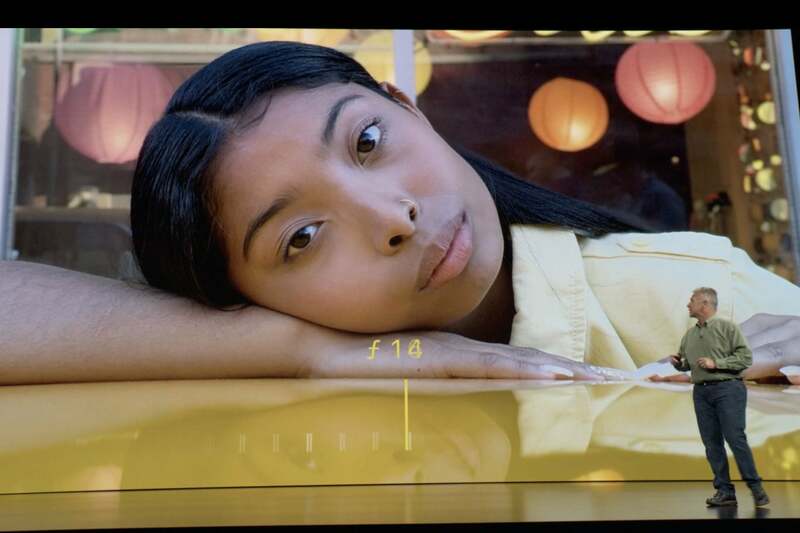 You can now adjust the depth of portrait mode photos from f/1.4 to f/16 after you take the shot, too. You’ll be able to adjust the depth effect of Portrait Mode shots even after you take it. In videos, you can now record stereo sound for the first time on an iPhone. The iPhone XS Max has the biggest battery ever in an iPhone, and Apple claims it lasts up to an hour and a half longer than ever. The radios have been improved, with Gigabit LTE and more supported bands for worldwide roaming. Apple is using an internal eSIM and standard microSIM for dual-SIM support. In China, Apple will sell a model with a two-sided SIM tray for two physical SIMs, since they can’t use eSIMs there. 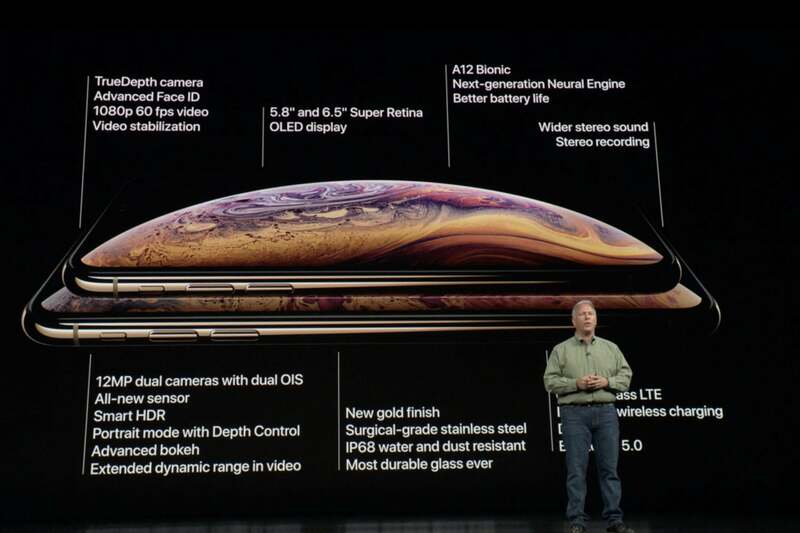 The iPhone XS will come in 64GB, 256GB, and 512GB capacities, starting at $999. The iPhone XS Max will cost $100 more, starting at $1,099. They both will be available for preorder on September 14, and ship on September 21. It’s 6.9 billion transistors big, with a new Apple-designed 6-core CPU. The two high-performance cores are up to 15 percent faster than the A11 Bionic but use up to 40 percent less power. The four high-efficiency cores use up to 50 percent less power. 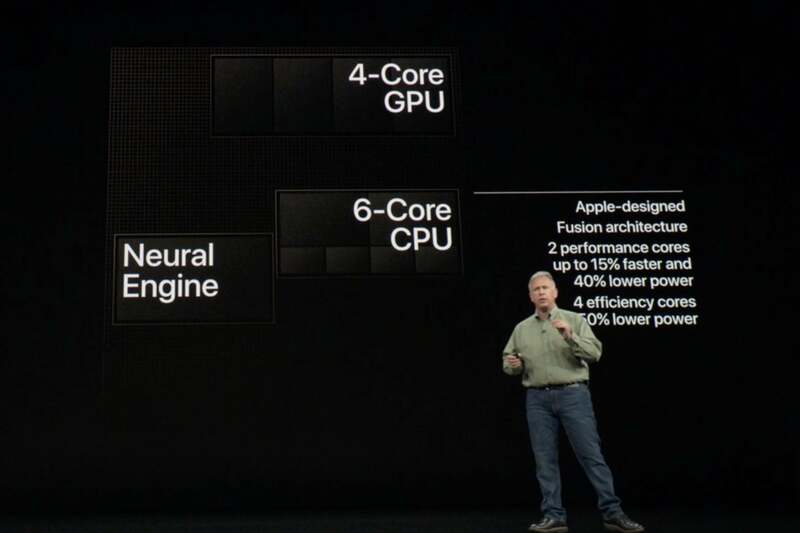 The graphics processor, also Apple-designed, is claimed to be up to 50 percent faster. The A12 Bionic has faster and more energy-efficient processor cores and a much more powerful graphics processor. 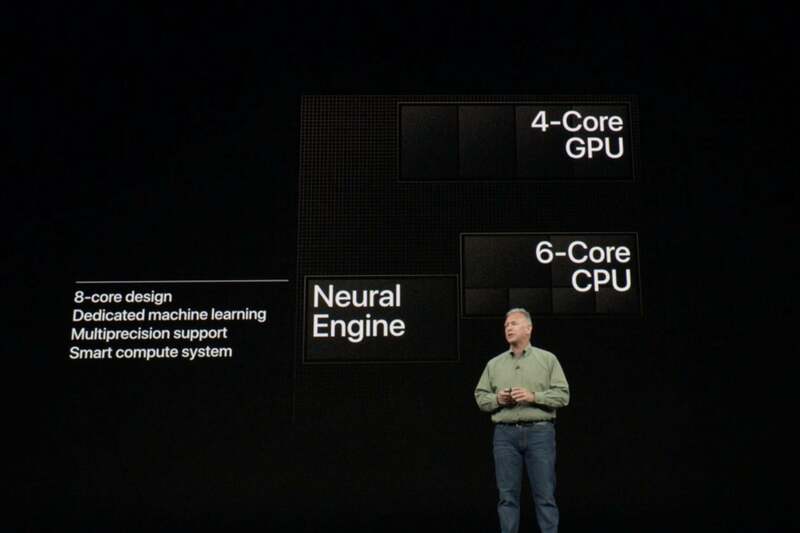 Apple has seriously beefed up its Neural Engine. This machine-learning optimized part of the chip was a dual-core design in the A11, and could process up to 600 billion operations per second. In the A12, the Neural Engine is a new eight-core design and can process up to five trillion operations per second. Developers can now use the Neural Engine with CoreML, which lets them perform machine learning operations up to nine times faster with as little as 10 percent of the power. The biggest improvement in the A12 is to the Neural Engine, which has gone from 600 billion operations per second in the A11 to over 5 trillion in the A12. Apple says the A12 improves every aspect of the sprawling system-on-chip, including improved image processing and a storage controller than can address up to 512GB. With it, apps launch up to 30 percent faster. The iPhone XS and XS Max may look just like the iPhone X, but they’re full of improvements. 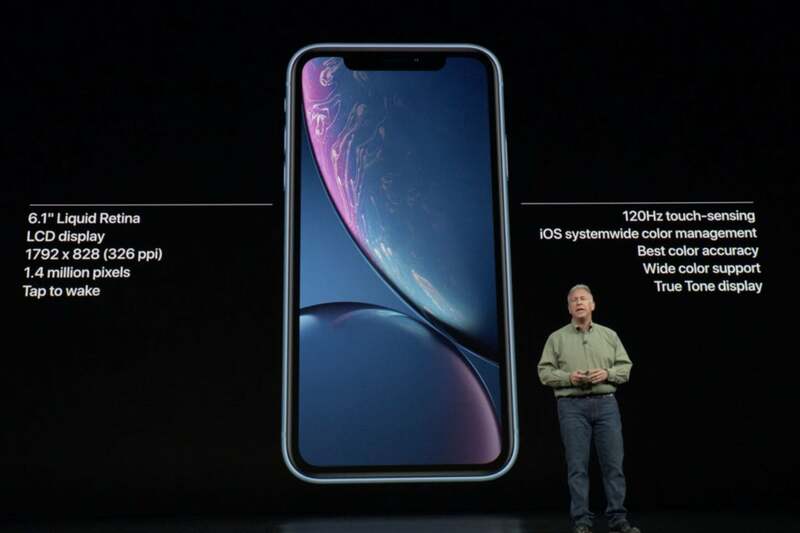 In addition to the high-end iPhone XS and XS Max, Apple introduced a more affordable iPhone XR. It looks similar to the iPhone X, with an edge-to-edge 6.1-inch display and a notch for the TrueDepth module (the same one as on the new iPhone XS and XS Max). It’s IP67 water and dust certified. Apple managed to make an LCD screen go edge-to-edge like the OLED on the iPhone X, but the resolution is lower. The display is a new LCD, which Apple has dubbed a “Liquid Retina” display. It has a lower resolution than the iPhone XS—1792x828—but it still has Tap-to-wake, True Tone, wide color range, and 120Hz touch sensing. The iPhone Xr doesn’t have 3D Touch, but it provides the same features with haptic feedback, which Apple calls “Haptic Touch.” It’s similar to the MacBook touchpad. You still get the same A12 Bionic processor, and even though the iPhone XR has only a single rear camera, it is identical to the improved wide-angle camera in the XS and XS Max. And now, for the first time, you can take Portrait Mode shots with the iPhone XR, even though it only has a single rear camera. The iPhone XR is honestly better than the iPhone X in most ways, and starts at $749. Apple claims the iPhone XR will last up to an hour and a half longer than the iPhone 8 Plus. The iPhone XR come in six colors and will ship in 64GB, 128GB, and 256GB capacities, starting at $749. It will be available for preorder on October 19 and will ship on Oct 26. Apple took a moment to remind us that the HomePod now supports stereo pairing and AirPlay 2, and will get a host of new features with the iOS 12 Siri Shortcuts feature. The Apple TV 4K gets a nice iOS 12 update as well, adding Dolby Atmos sound. Apple will release these updates, along with iOS 12, on Monday, September 17. Apple gave us the release date for macOS Mojave as well: Monday, September 24.